Perhaps one of the most important types of rings that you will have to purchase is a wedding ring. Besides engagement rings, wedding rings are probably the most crucial of all ring purchases. The symbolism behind a ring of this type is so great that choosing a perfect ring is a very important task. There are many decisions a couple needs to make with regard to choosing wedding rings. Things such as metal type, style and size are part of this decision-making process. Another factor couples consider when purchasing wedding rings is price as they are often paying quite a bit on other wedding necessities. This article will provide an overview on various choices that come into play when choosing the perfect wedding band. Using the term metal alongside the word wedding band is not the most romantic thing in the world; however, the ring is indeed composed of a metallic material and one has a wide range of options when looking to purchase a particular type of wedding band. Gold is one type of material that a couple may choose to have their wedding rings made of. Rings made of gold come in either white gold or yellow gold in a variety of karats, i.e., 10 karat, 14 karat, or 24 karat. 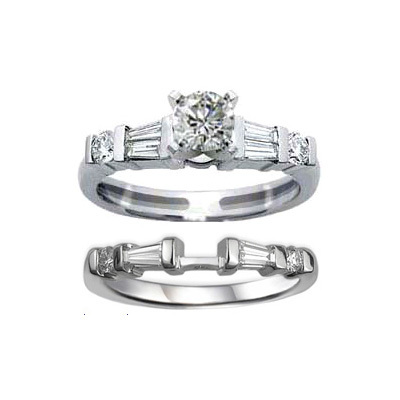 Another popular type of metal that wedding rings are composed of is platinum. 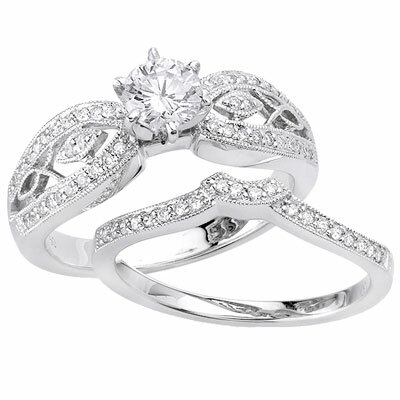 Platinum wedding bands have become increasingly more desirable in the past few years. Platinum rings tend to be pricier than gold ones; however, it is a beautiful metal type that is strong as well. If it will not empty your pocketbook or wallet, platinum is a great choice for a wedding ring. Couples in pursuit of the perfect wedding rings will also find that they come in a variety of sizes and styles. Almost any wedding band can be sized to adequately fit the finger of any individual. If you can find the perfect-sized ring without having to alter the size thereafter, then that is your best bet as frequent sizing of a ring may alter the strength thereof (this is usually only true if you have the ring sized more than once). There are also a number of different unique and exquisite styles of wedding rings for both men and women. If you go to a jewelry store, you may be surprised at just how many different styles of wedding bands are available to the general consumer. You can have the rings engraved or even embedded with diamonds and other gemstones. Baguettes are becoming increasingly popular for women's wedding rings and these beautiful additions add so much to a basic ring. Some wedding rings will have various types of gems inlayed in them and individuals may sometimes choose to have their birthstone as part of their wedding ring to add a little something extra to it. There is so much that you can do to make your wedding rings unique and special. Another less romantic factor that couples need to consider when purchasing a wedding ring relates to pricing. As individuals are oftentimes on a strict budget while planning their wedding, they may have to set a limit of how much they are able to spend on wedding rings. There are a few ways to get the most bang for your buck when shopping for wedding bands. End of season sales are a great way to take advantage of large discounts and still get the ring that you want. A lot of times a jewelry store or department store will have an end of season clearance sale on various types of jewelry, including wedding rings. By taking advantage of these types of sales, you may find the perfect ring at a great price. It is always important to keep an eye out for retailers who are having clearance sales. Utilizing coupons is a second way to keep the total price of your wedding ring purchase to a minimum. Department stores will often print coupons in their mail circulars that may give you a good percentage off of the price of jewelry and since many department stores stock wedding rings, this is a great thing to take advantage of. One last way to get a good price on wedding rings is to use the internet to find the perfect ring. Since shopping for a wedding ring over the internet may not appeal to all individuals, it is important to be aware of a certain little trick that will enable you to get a good price over the internet but choose your ring in a retail store. If you are in a particular store and see a wedding ring that strikes your fancy, try it on, find the perfect size and then go home and see if that store has a website. If they do, take a look online and see if that particular ring is offered at a lower price via the web. Sometimes you will get lucky, other times you won't. Regardless, it never hurts to take a peek and see. These are just a few things to consider when trying to find the perfect ring. If you know what your options are prior to securing wedding rings, you will be more informed and feel better prepared in your quest for the most spectacular wedding ring.